Source of Earliest Record: Bencao Tujing. This herb is the dried root of Rehmannia glutinosa (Gaertn.) Libosch. The dried root is mixed with yellow rice or millet wine, Pericarpium Citri Reticulatae (Chen Pi), and Amomi Fructus (Sha Ren), and then alternately steamed and dried in the sun until it turns black inside and outside with a soft, sticky, and oily texture. Then it is sliced for use. Functions: To nourish blood and replenish yin. 1. Deficient blood syndrome manifested as sallow complexion, dizziness, vertigo, palpitations, insomnia, irregular menstruation and uterine bleeding. 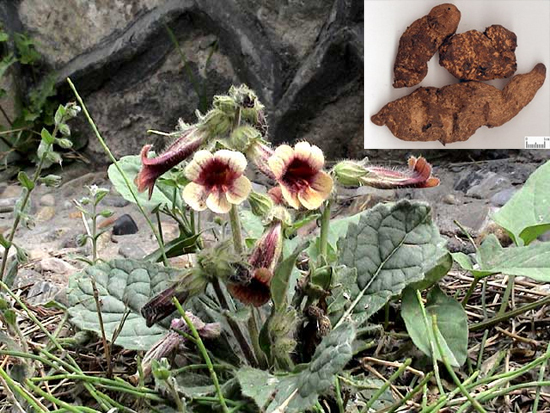 Prepared rehmannia root (Shudihuang) is used with Chinese angelica root (Danggui) and White peony root (Baishao) in the formula Siwu Tang. 2. Deficient kidney syndrome manifested as afternoon fever, night sweating, noctural emissions, diabetes, dizziness and blurred vision. Prepared rehmannia root (Shudihuang) is used with Dogwood fruit (Shanzhuyu) and Dioscorea (Shanyao) in the formula Liuwei Dihuang Wan. 3. Deficient yin and excessive fire syndrome manifested as afternoon fever, feverish sensation on the palms, soles and in the chest, night sweating, noctural emissions, red tongue proper with scanty coating and thready, rolling and rapid pulse. Prepared rehmannia root (Shudihuang) is used with Tortoise plastron (Guiban), Anemarrhena rhizome (Zhimu) and Phellodendron bark (Huangbai) in the formula Zhi Bai Dihuang Wan. Dosage: 10-30 g, decocted in water for internal use. It is used with herbs that strengthen the Spleen and Stomach, such as Amomi Fructus (Sha Ren) and Pericarpium Citri Reticulatae (Chen Pi). Cautions & Contraindications: Contraindicated in patients with copious sputum due to Qi Stagnation, gastric and abdominal distension, poor appetite, and loose stools.